When you connect your iPhone to your computer, iTunes downloads this protocol file and stores it on your local Mac or PC. That is unencrypted. Meaning – everybody who knows where that file is and got access to your computer, is able to check where you went. Apple does not specify why this data is being collected. It might serve as a basis for future services, but that is pure speculation at the moment. The programmers Alasdair Allan and Pete Warden wrote a small program, which allows you to display the position data your iPhone has gathered about you. 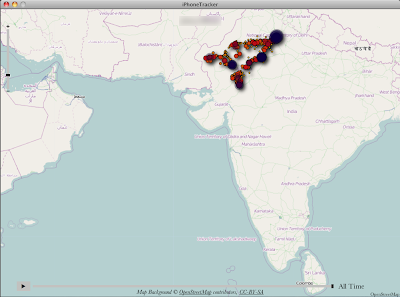 The software is called iPhone Tracker (Mac only, sorry PC users). I tested it and – who would have thought that – my iPhone also protocols my movements. It starts with this screen, showing you the complete world map. Obviously I have been moving around in Germany and India. 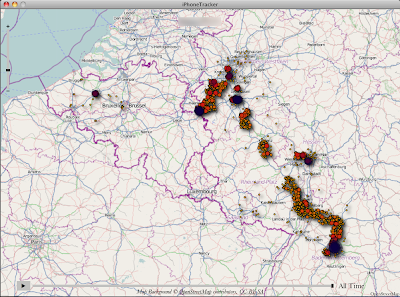 Zoomed in into western Germany, France, Belgium and the Netherlands. The protocoled contacts follow the Autobahn south to Stuttgart, where I went on a business trip end of 2010. You might wonder why there are such big gaps in the movement data – the iPhone only protocols your position if you have enabled “Location Services” in the system menu. I personally only switch this service on when I need it. Saves battery. 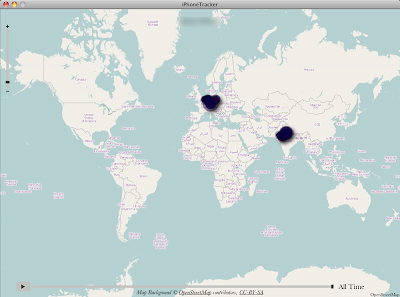 But despite the gaps, you can clearly see which cities I have been to, and the protocol also reveals when I went there. Example 2 – Zoomed in on the India trip. One can see the route quite clearly. Much contact in Delhi and many contacts along the road. In fact I used the location services in India quite often, because I wanted to know how far it was to the next city on the long and tiring car drives. 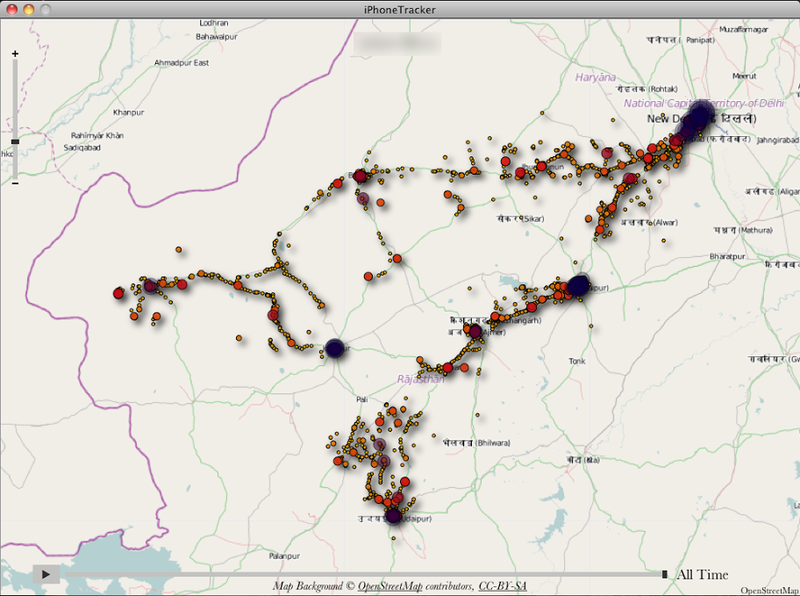 So now we know that your iPhone4 tracks your movement. And the data is unencrypted as a standard setting (encrypting your iPhone backup is easy: There is a checkbox in iTunes you have to tick in order to encrypt your iPhone4 backup, see below. Please remember NOT to store the subsequent password you have to enter in the keychain ! 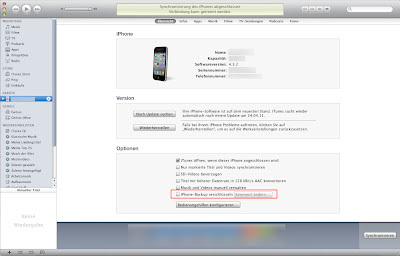 With this measure you have encrypted the backup, but the iPhone4 is still logging the position data. As far as I have read, there is no way of preventing the iPhone from doing so when the location services are activated. I won’t give my five cents to the debate on whether it is good or bad that such profiles are being created. I for myself do not want this to happen, but with today’s mobile technologies and social media it is to some extent unavoidable that this happens. Not using the internet is not the solution obviously. So I see no other way than deactivating or securing these options as much as possible. Encrypting the database is a measure…. but if Apple decides to transmit these protocol files with future system updates, I doubt that you can do anything against the transmission of the data… except pulling the plug on your computer. To reiterate, this is not an option as you might agree.